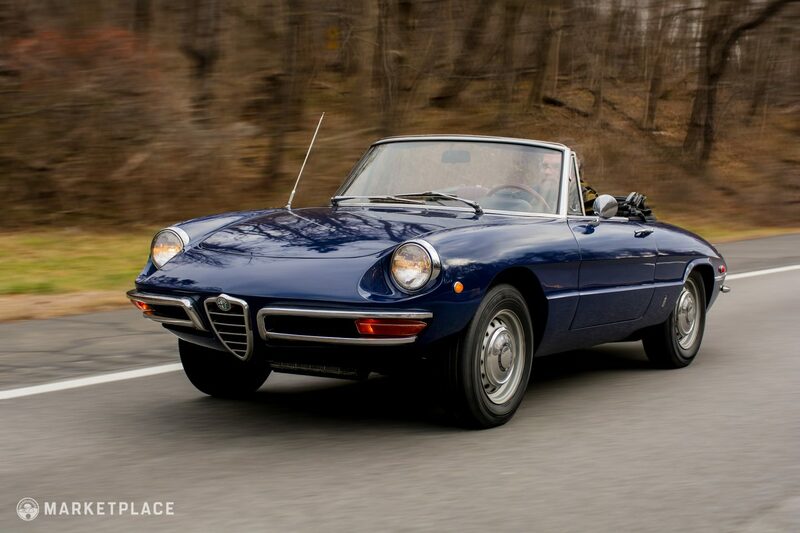 From its debut at Geneva in ‘66, through international stardom via Hollywood, Alfa’s little Duetto Spider became a defining element of the late ‘60s automotive scene. 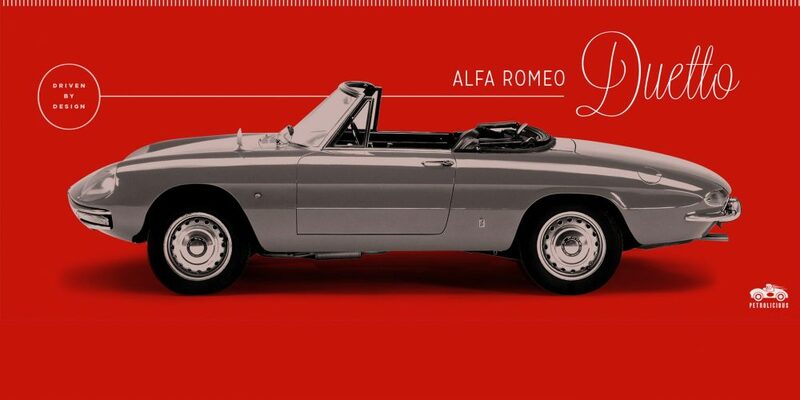 As the decade drew to a close, Alfa went to work perfecting the car and further cemented its legacy as an Italian motoring triumph. 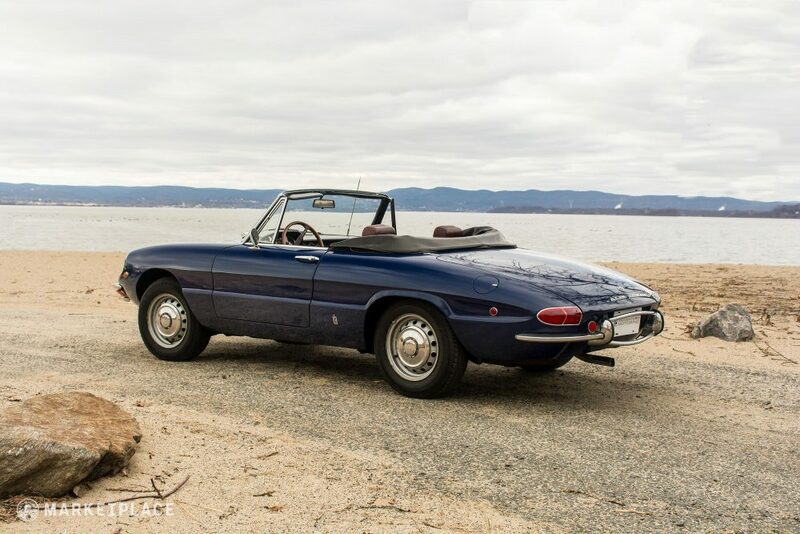 Not long after the Spider’s debut, a new Giulia lineup introduced the legendary 1750 engine to replace the previous 1.6 liter design. 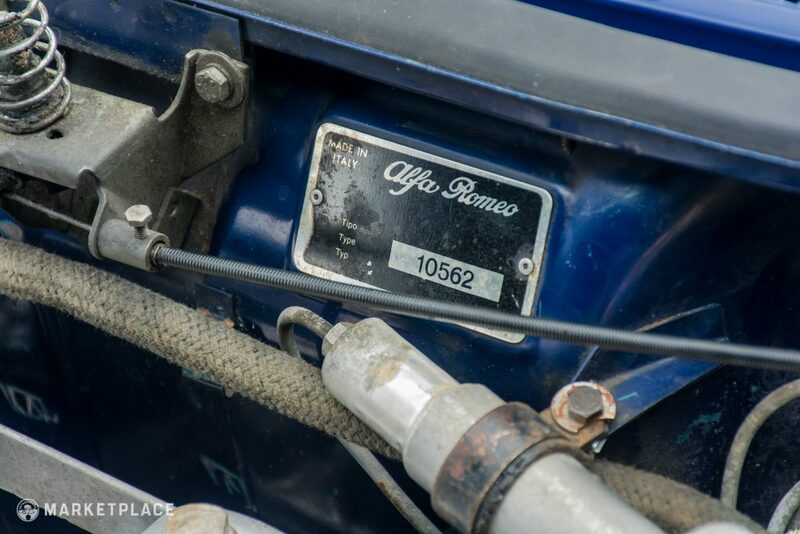 Actually displacing 1779cc, it was close enough in size to Vittorio Jano’s historic 1750cc engine in the Alfa 6C to merit this storied numerical designation within the company. 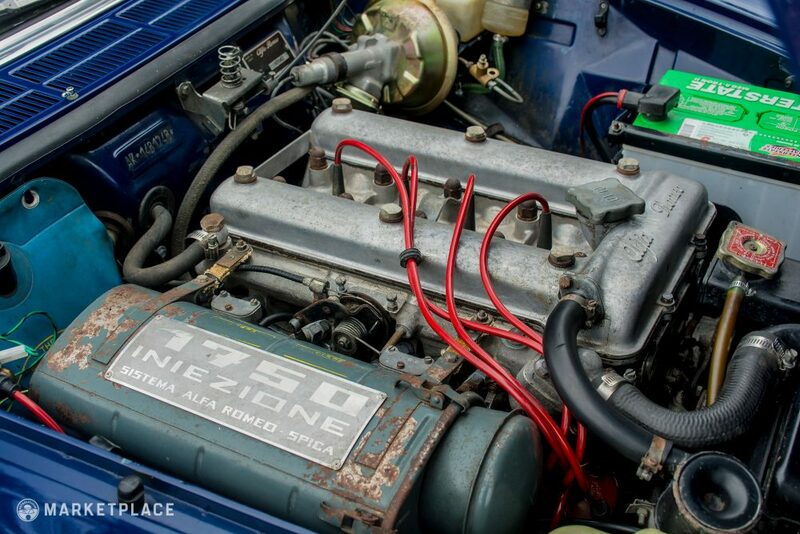 For the US market, Alfa’s bold new SPICA (Società Pompe Iniezione Cassani & Affini) mechanical fuel injection took the place of traditional sidedraft Webers, bringing advanced, modern performance to the masses. 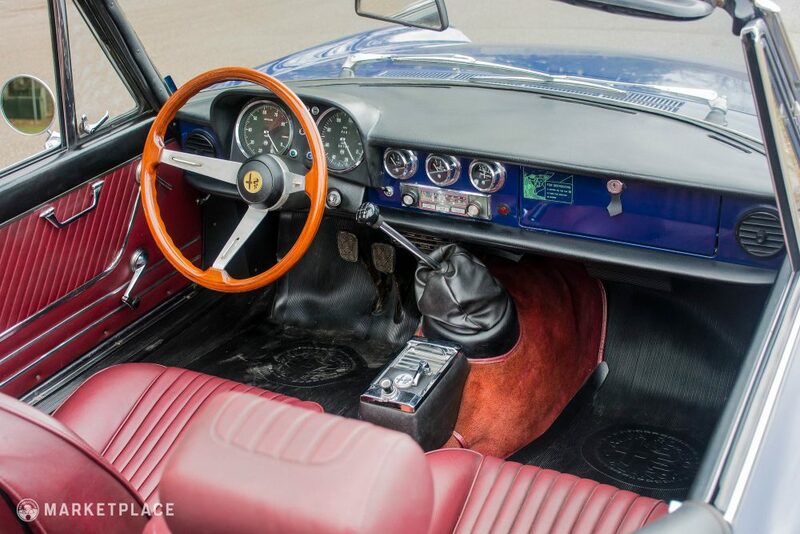 Surprisingly, the motoring press did not appreciate the Spider’s look at first. 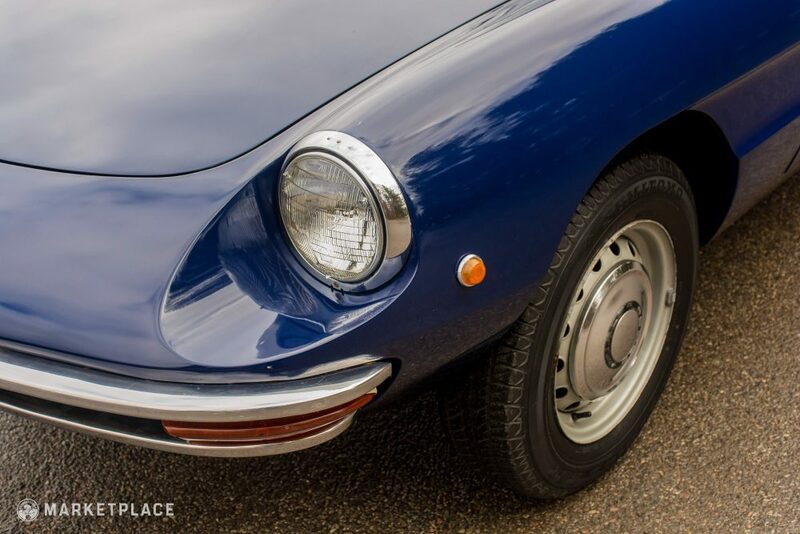 It may be hard to comprehend fifty years later in this era of bloated, plastic nonsense, but much of the press’ negative sentiment came from the lack of continuity with the lines of the earlier Giulietta. 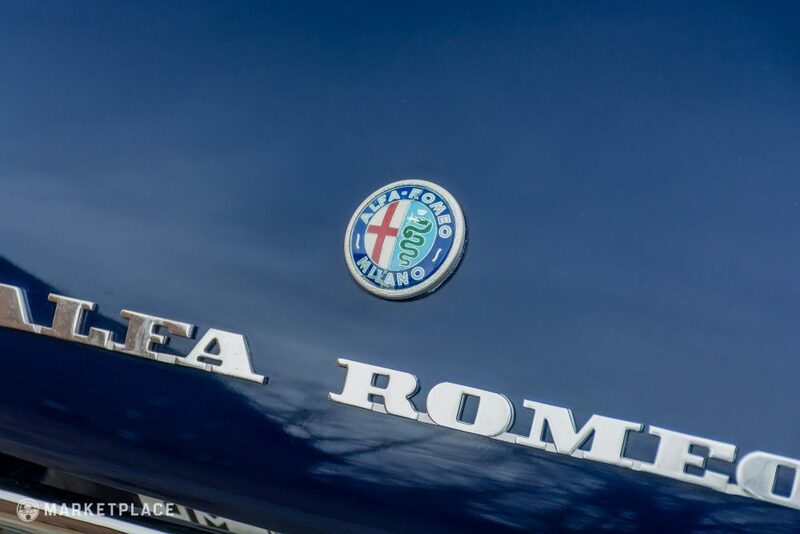 With the new design only a couple years old at the time of the 1750 upgrade, Alfa stuck to their guns and doubled-down on the Osso di Seppia (cuttlefish bone) rear end and associated styling touches. 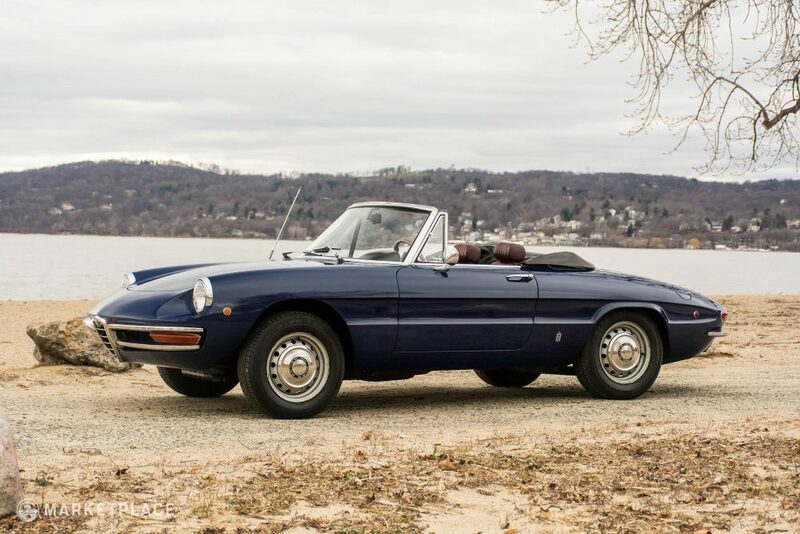 The 1750 Spider showed a few minor changes, including revised rear badging, front side marker lamps moved ahead of the wheel, and the addition of small seatback headrests. Signature flourishes like the deep-set headlights, concave side panels, and minimalist bumpers persevered. Viewed alongside later iterations, it becomes clear that the original Spider was an incredibly pure and well-resolved design. 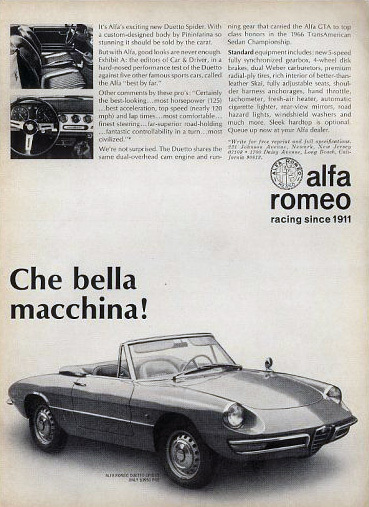 In many ways neither Alfa nor Pininfarina have matched it since. 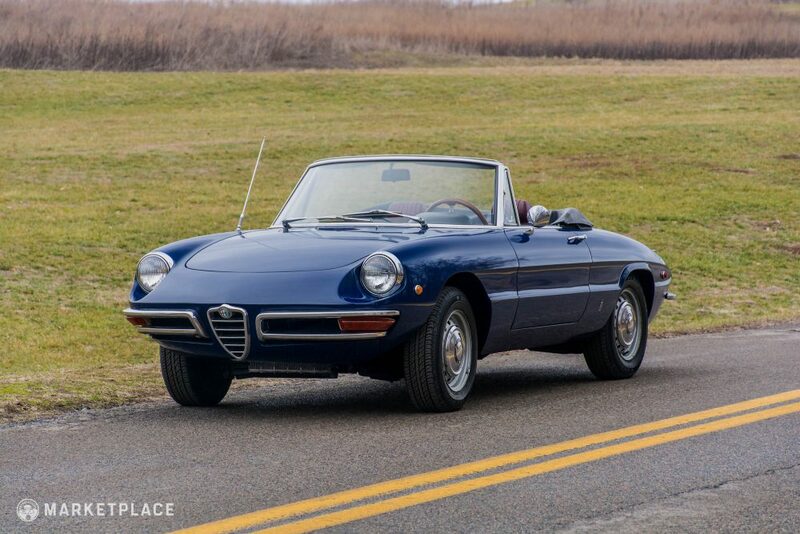 In 1970, Cynthia Matthews, a noted American photographer, traveled to Europe to collect her new ’69 Alfa Romeo 1750 Spider Veloce. 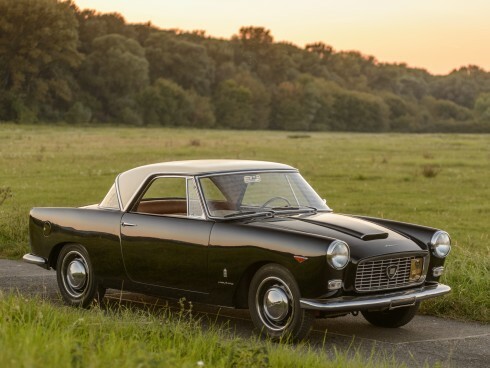 Service coupons reflect an epic continental road trip– she drove nearly 3000 miles overseas before it was shipped to Alfa’s North American distributor in Newark, NJ. 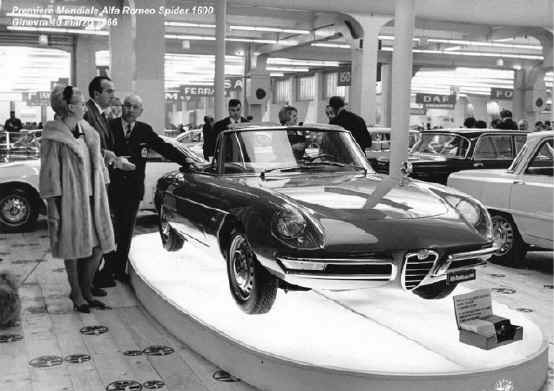 A few months later, in April of 1971, Cynthia and her Spider were featured in Il Quadrifoglio magazine. 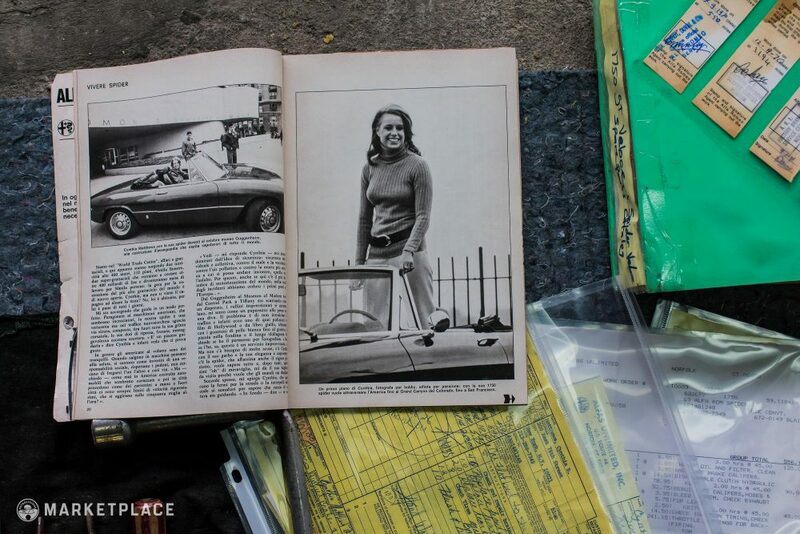 A full-color photo-shoot and accompanying article show her enjoying the car throughout NYC, European export plates and all. 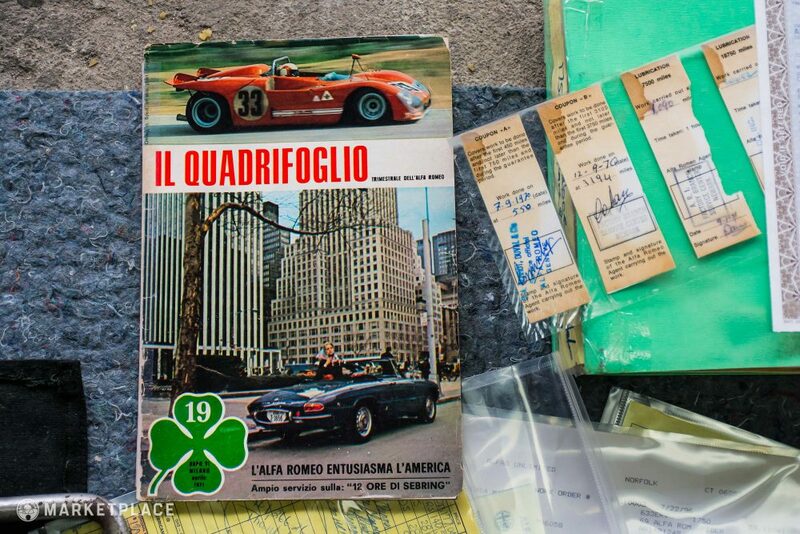 The Italian text includes some revealing commentary in English: “The best looking car of this race” declares Cynthia on the first page. 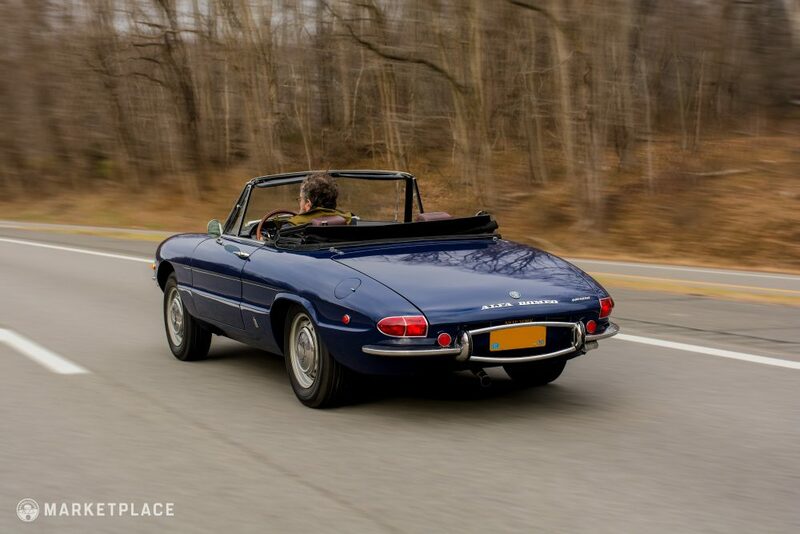 For 45 years she cherished her Spider, compiling pages of service records while keeping the mileage low. 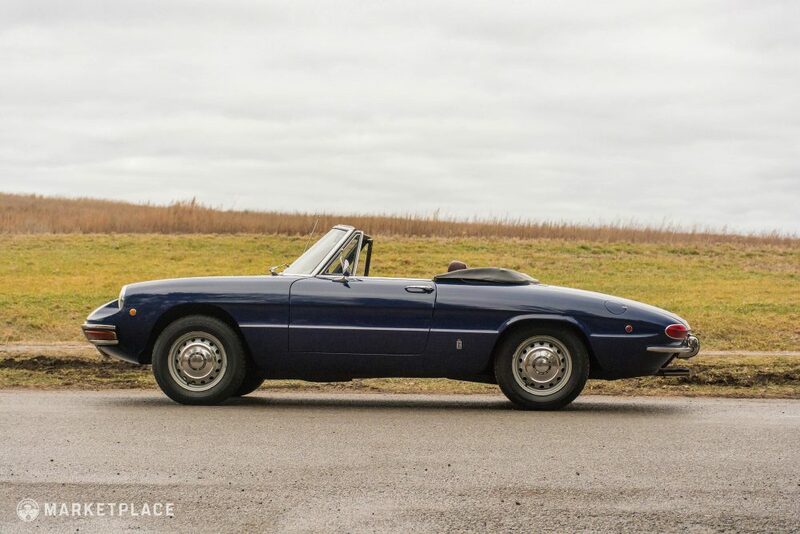 After decades together, Cynthia decided to part with her longtime automotive companion in 2016. Thanks to a tip from a local Post Office employee, current owner Jerry Calabrese and his friend Alex Gouras came across the Spider stored in a Connecticut barn. 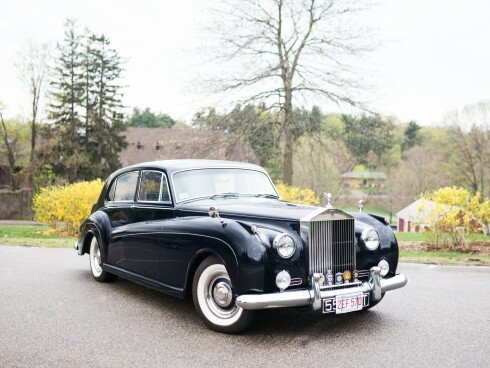 Impressed by its story and incredibly well-preserved condition, they immediately purchased the car and brought it home. After some minor fixes the Spider re- emerged, ready to be driven and enjoyed once again. 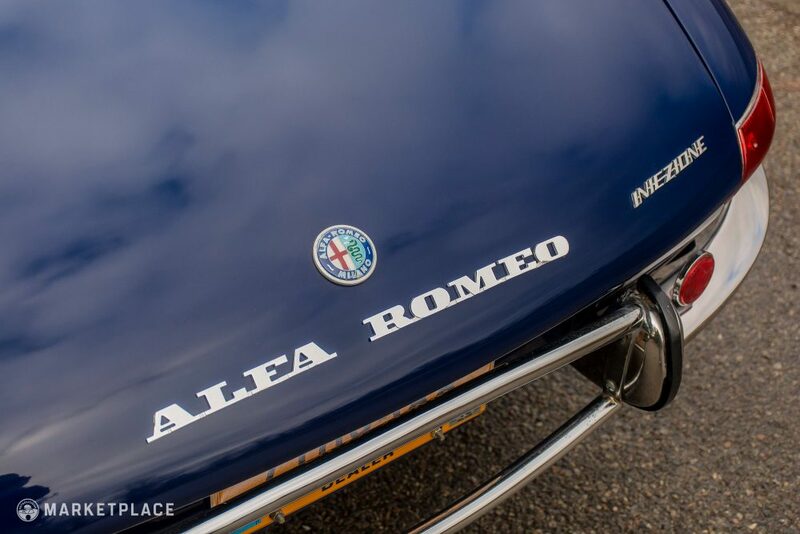 Body – Straight and sound throughout, with solid metal in all the typical Alfa trouble zones. 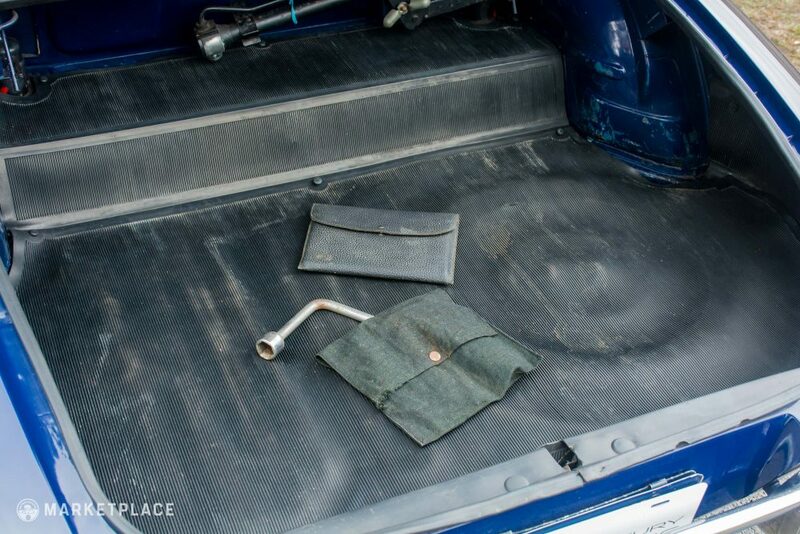 The only evident corrosion exists on the edge of the driver’s side floor pan drain plug. 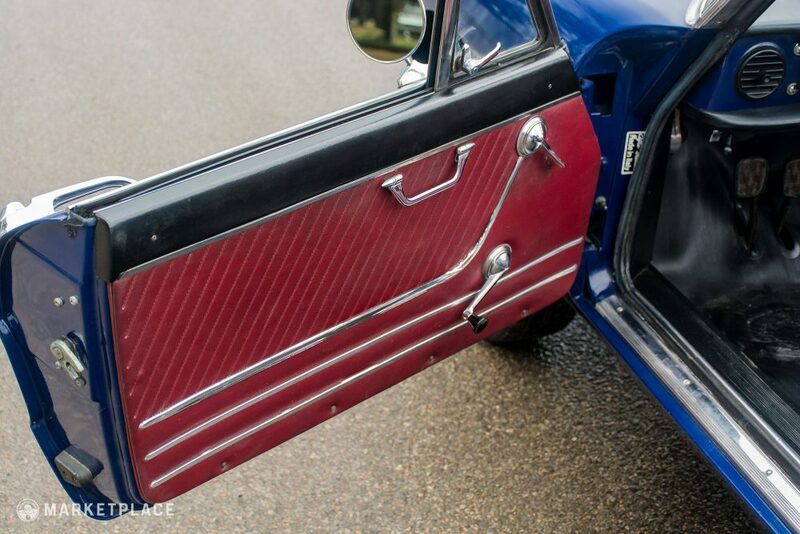 Panel gaps are superb, while the doors, hood, and trunk shut with a satisfying click. 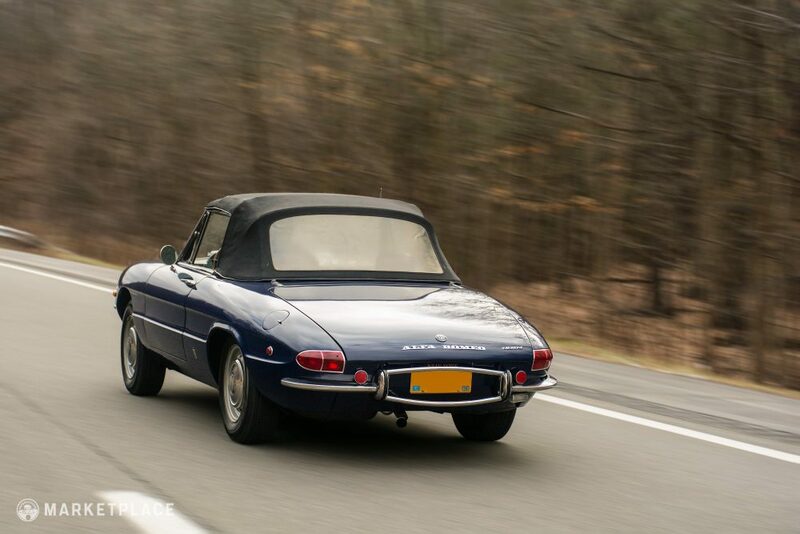 Paint – Resprayed years ago in its original color of Blu Olandese (Dutch Blue, AR 343), the paint has held up well throughout. There are some small areas of blistering and air bubbles, particularly on the passenger side front wing. 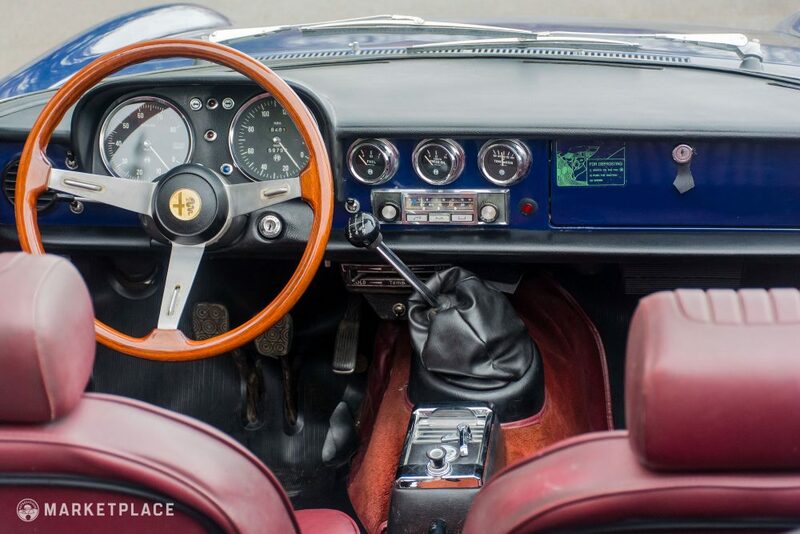 Chrome and Glass – All glass, including the windshield, is original and shows an acceptable level of patina. 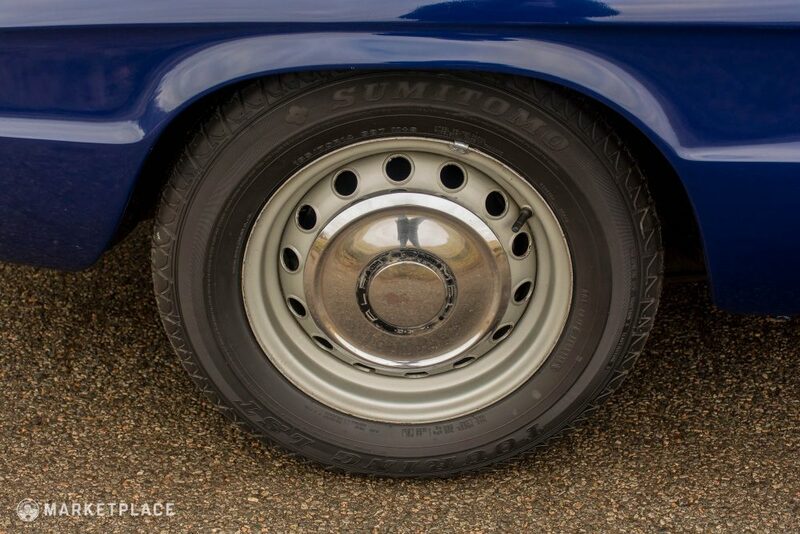 Chrome is similarly tidy, with only mild pitting and wear. 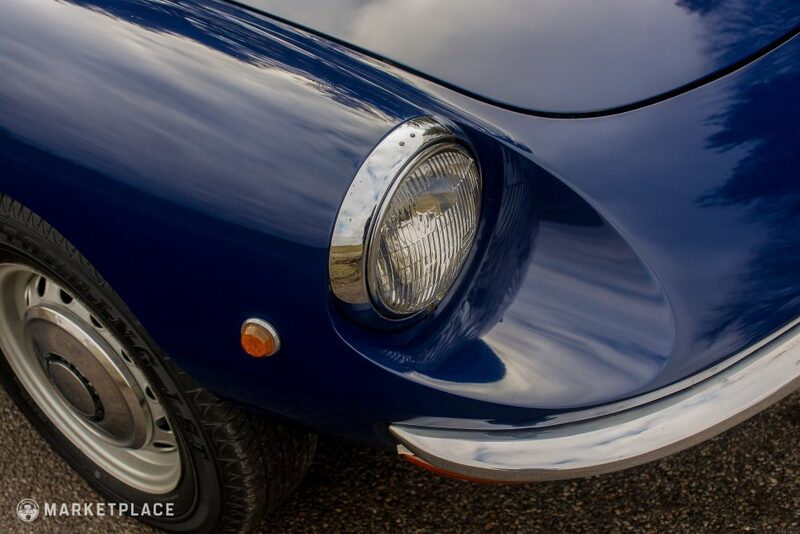 Lights and lenses are clear and in good condition, while the car’s rubber seals and gaskets appear supple and serviceable. 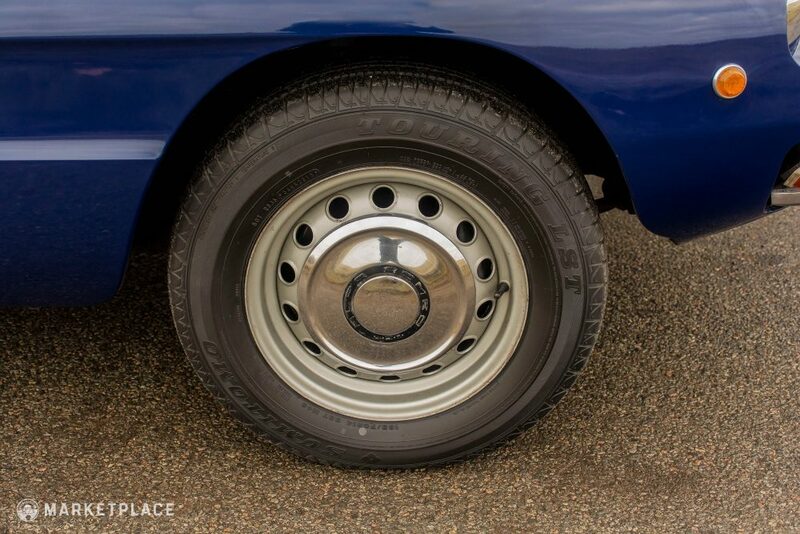 Wheels – Each 14” Alfa steel wheel features very presentable paint and beautiful, polished center caps. Tires are recent with lots of tread remaining. 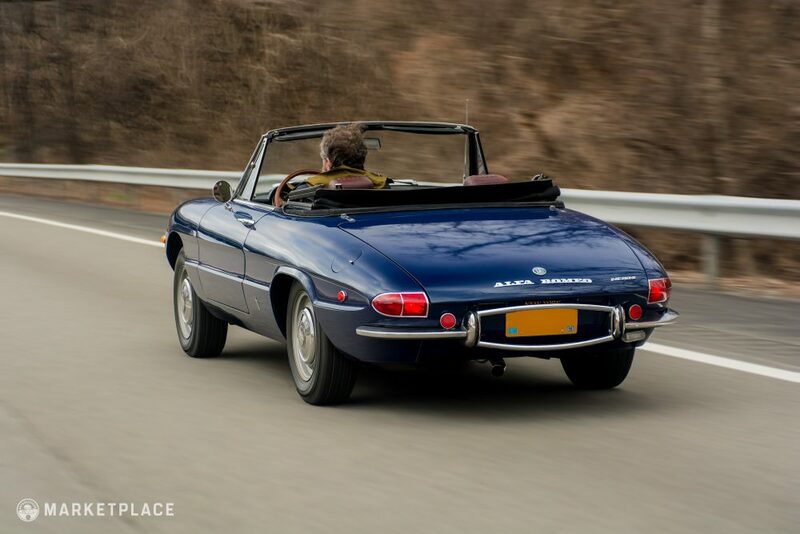 Convertible Top – The top is original and fits well, with minor wear present on some of the edges. The rear window shows some discoloration and fogginess, but is free of tears or cracks. 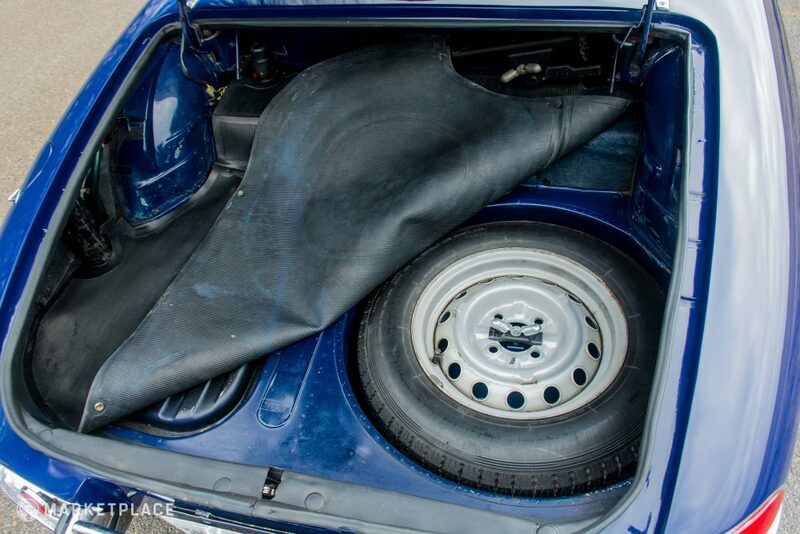 The easy- to-lose retaining strap is still intact, along with the original tonneau cover. 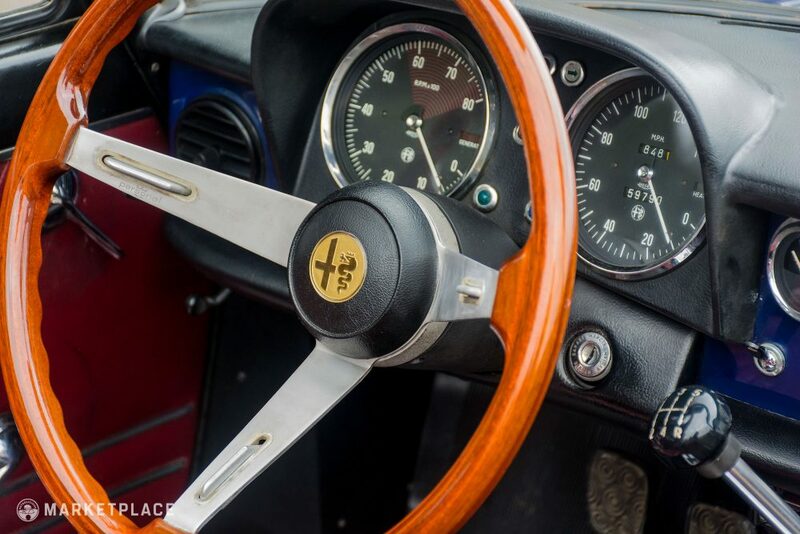 Steering Wheel – The car wears a gorgeous wood-rimmed Alfa wheel, a popular period upgrade. An original spec black lacquer-rimmed example is also included in the sale. 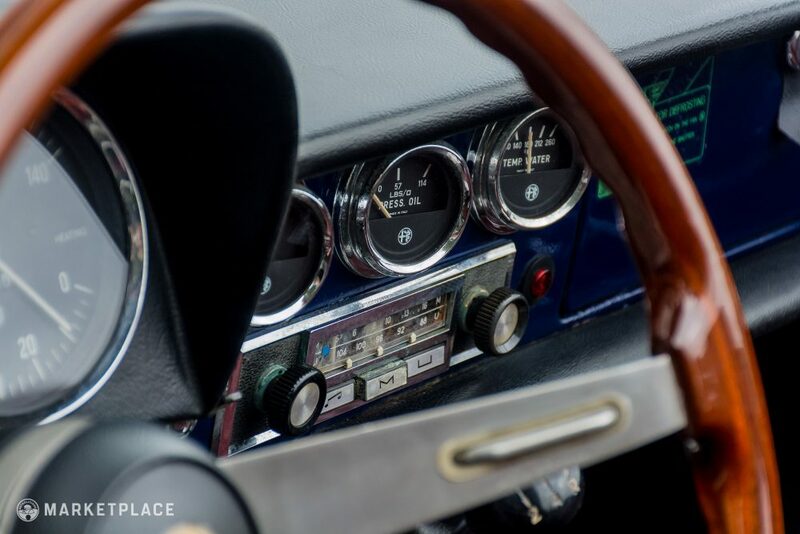 Dashboard & Instrumentation – The instruments are clear and work well, while the pristine dash features the rare defrost sticker– still intact on the glovebox door after all these years. The dashtop and sun visors appear similarly excellent, and a period, working Blaupunkt radio brings a lot of vintage charm to the cabin. 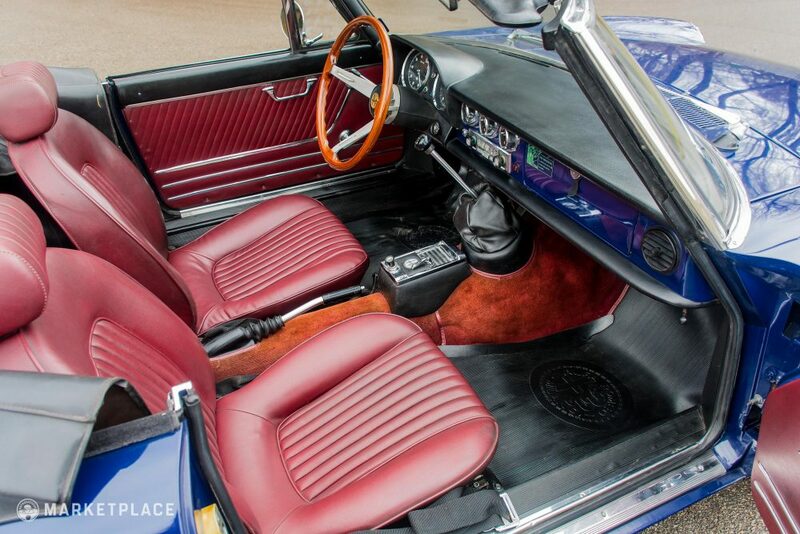 Seats, Trim, & Carpet – The stunning Amaranth seats are in perfect shape; the driver’s side recently had some seat bottom repairs though the end result matches flawlessly. 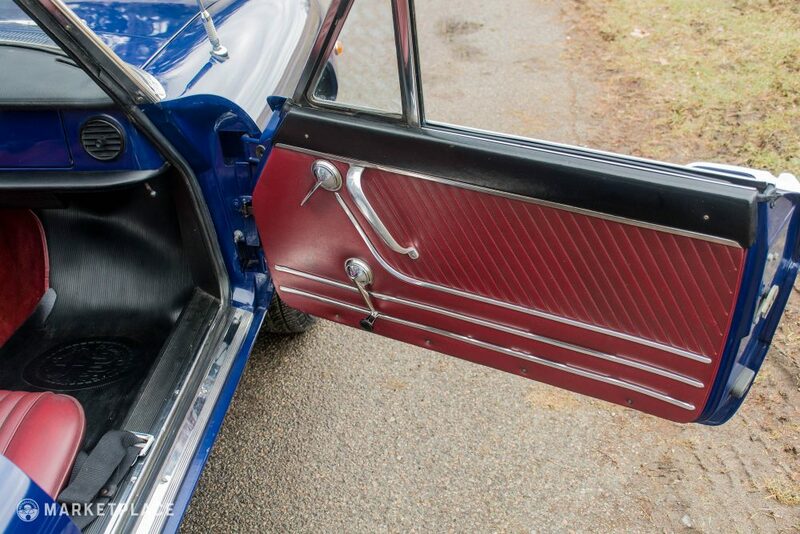 Both door panels are well preserved, as are the entire set of embossed rubber mats in the cabin and trunk. 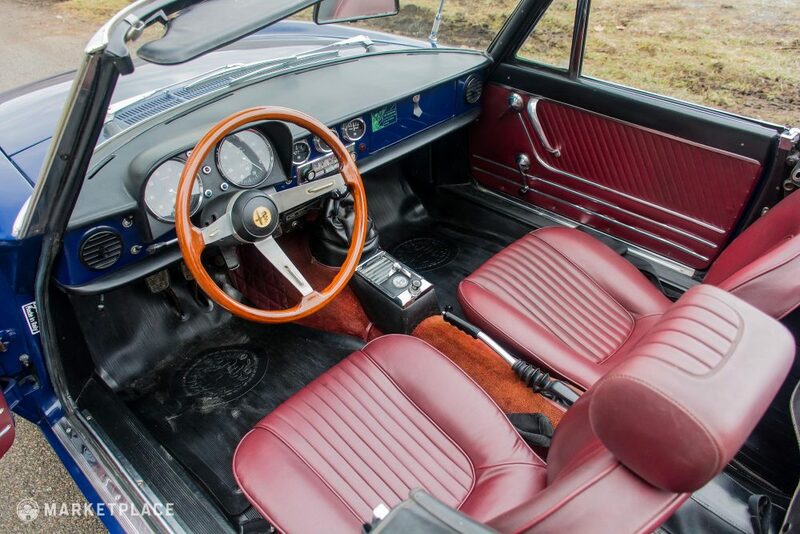 Original carpeting surrounds the gear lever, while the shift pattern is still clearly visible on the top of the knob. 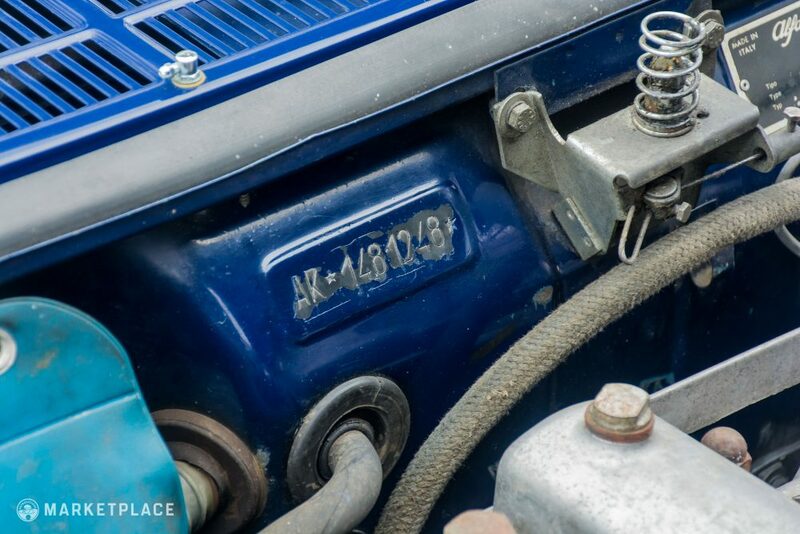 Engine – Well-maintained and tuned to a very high standard, the 1750 twin-cam pulls hard and sounds great through the stock exhaust. 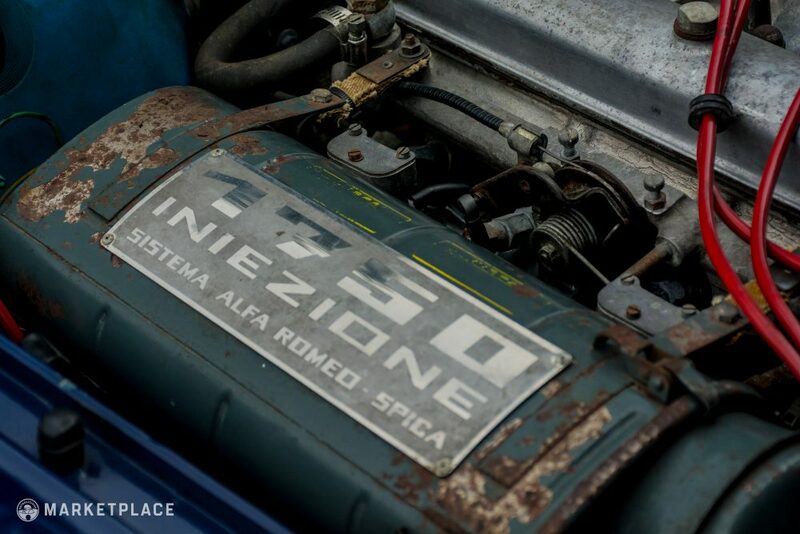 The SPICA injection is in excellent shape, providing easy cold operation, a consistent idle, and incredibly smooth acceleration. 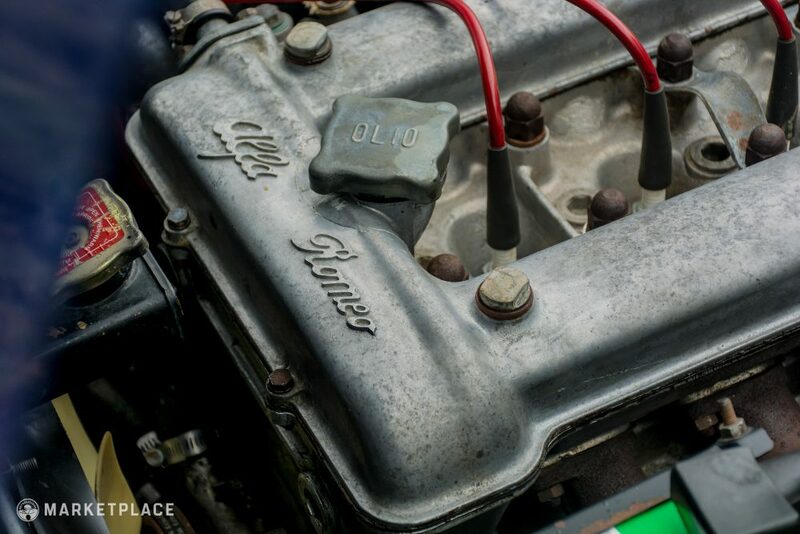 Original Motor: Believed to be original, as the engine number falls within the car’s production timetable according to Fusi. The SPICA pump is a slightly later version, though the original is included with the sale. 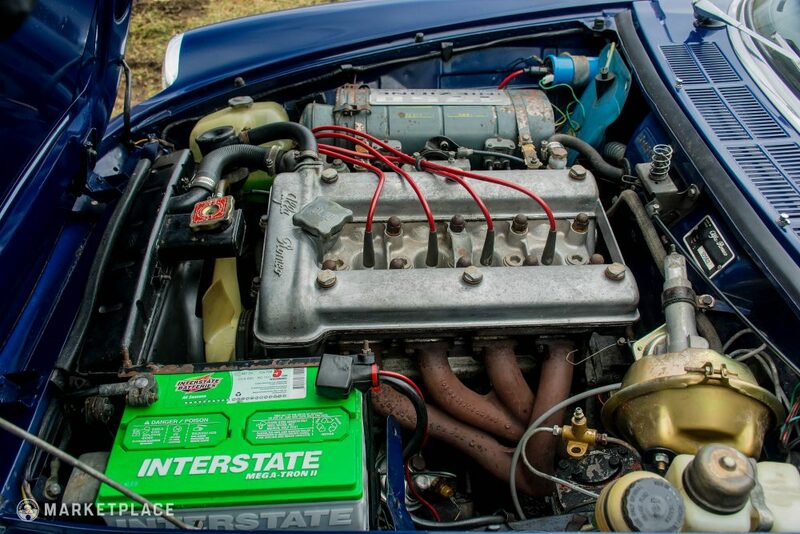 2016 Maintenance: August 2016 – Alfa Auto Clinic performed an oil change and replaced the injection pump filter, as well as tuned the engine and SPICA system. 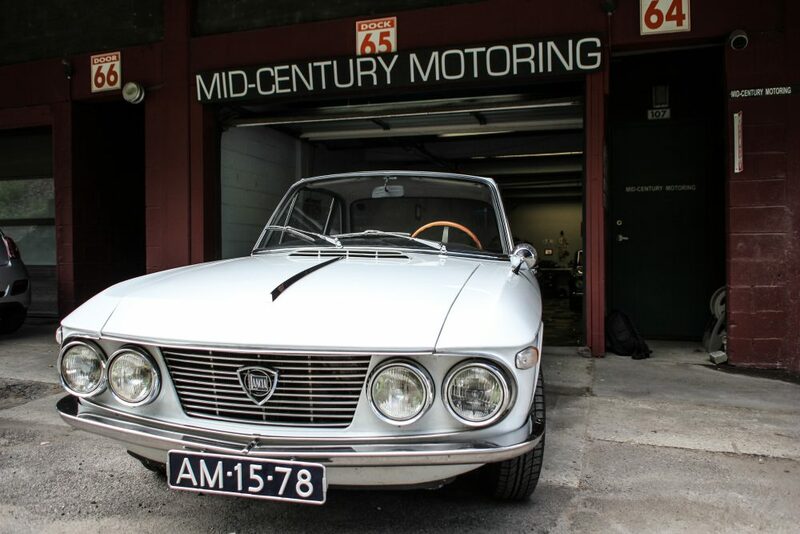 The Drive: Of all Giulia twin-cams, the 1750 is often considered the best of the breed. 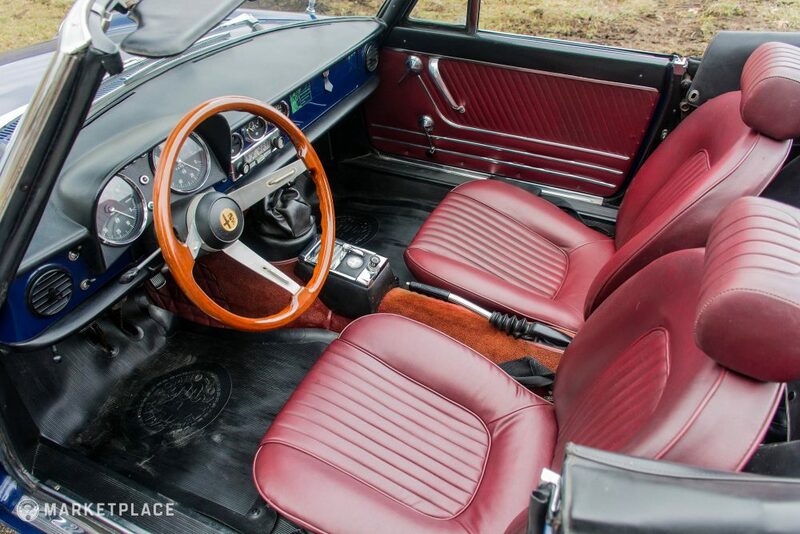 Livelier than the larger two liter variant, while retaining the charm of the less powerful 1600, it occupies a sweet spot in the Alfa hierarchy. 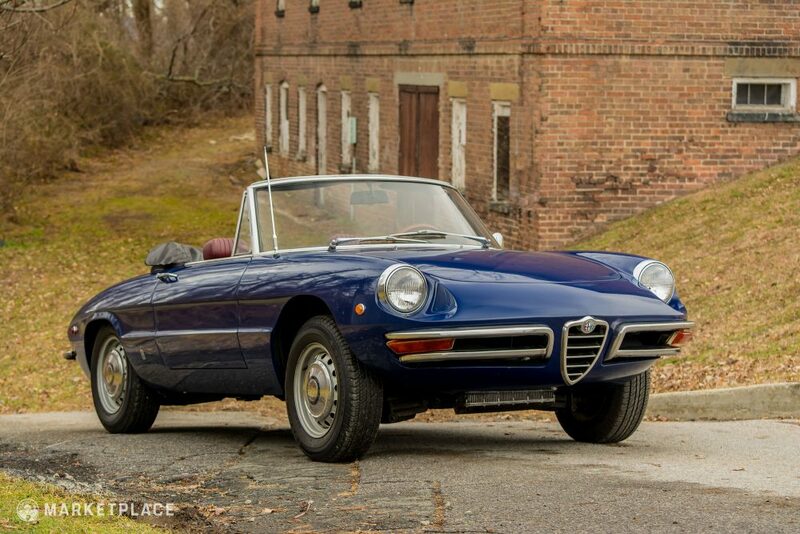 Transmission – Alfa’s 5-speed manual is found in all 105 series Spiders, and is in exceptionally good condition here. 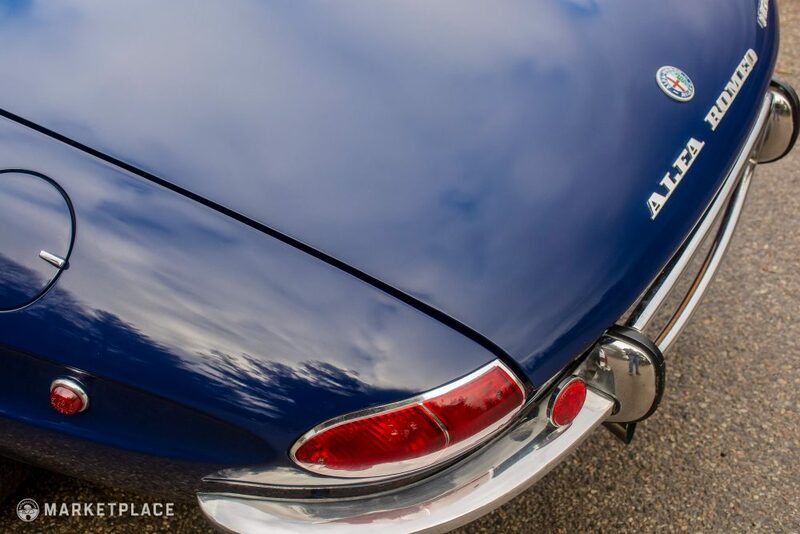 2016 Maintenance: Fluid change at Alfa Auto Clinic. 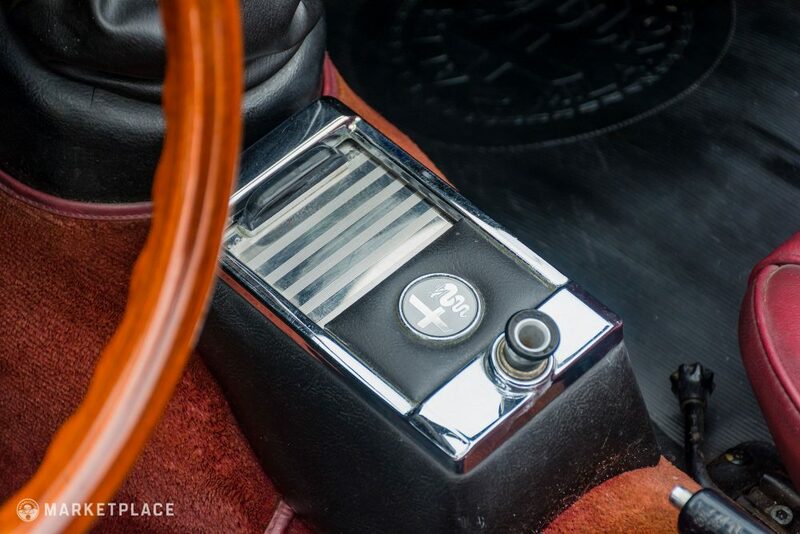 The Drive: A pristine Alfa gearbox is a privilege to use, rewarding the driver with a satisfying action and perfectly weighted throws. 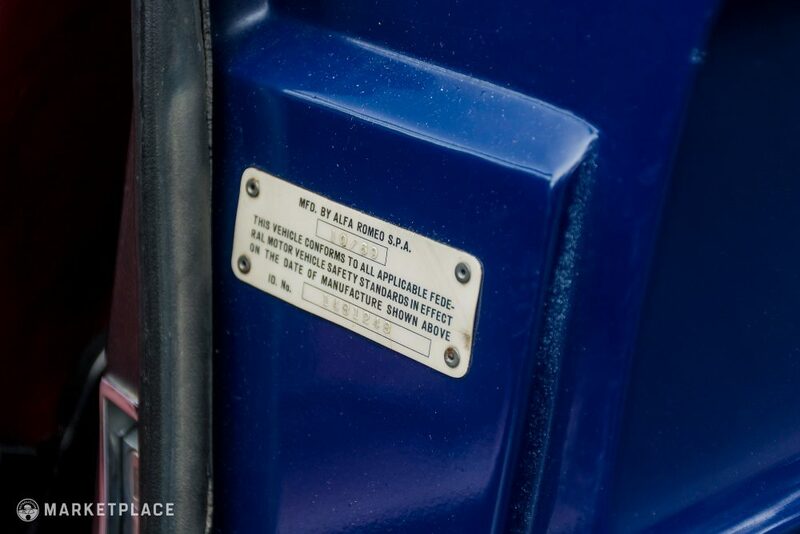 While synchros are known to be delicate in these cars, this example does not grind, pop out of gear, or show any evidence of wear. 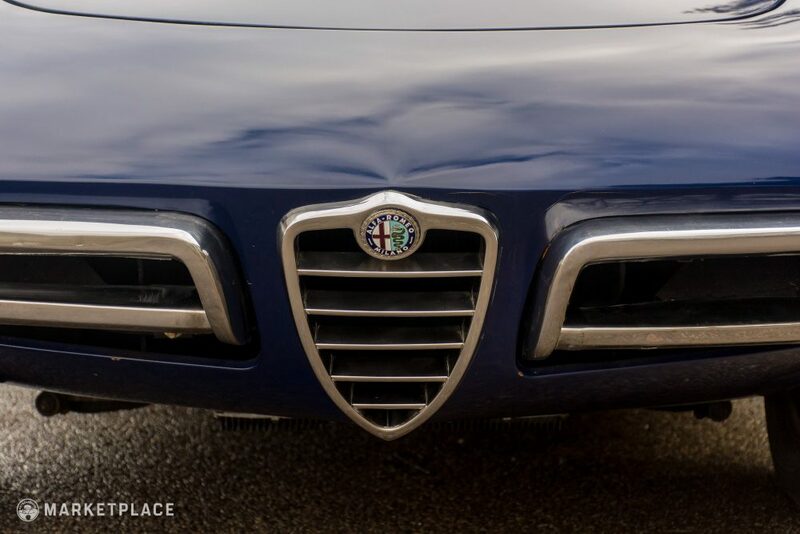 It is exactly as an Alfa should be: crisp and precise. Handling – Featuring four Ate disc brakes, independent front suspension, and precise steering, Spiders have always been talented in the bends. 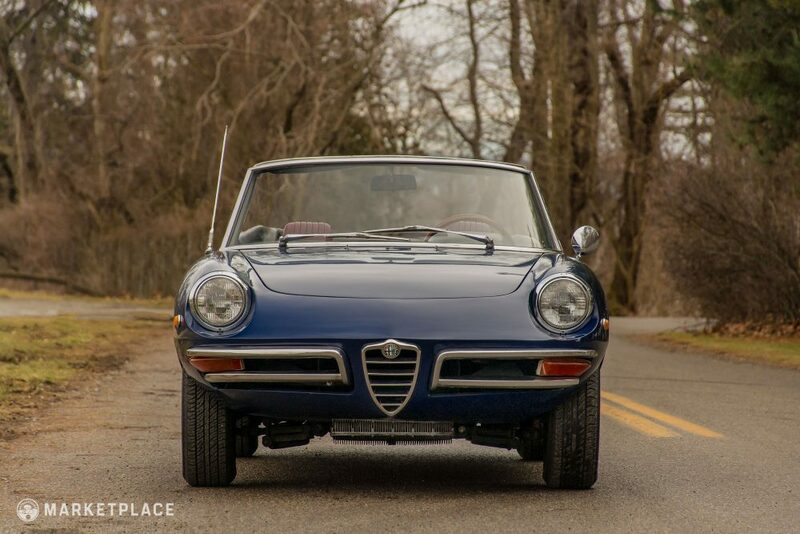 The Drive: Unbelievably tight and original, this car feels exactly how a stock Spider should. Comfortable and nimble, composed yet not too serious, it attacks a corner with gusto and delights with its poise and vintage feel. 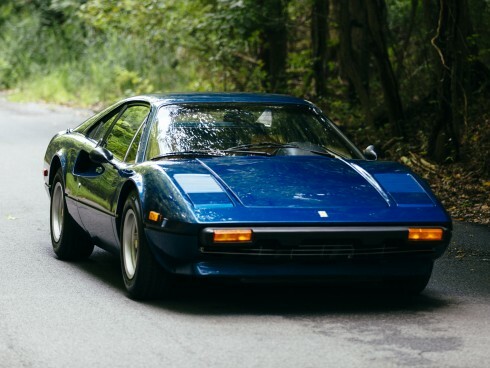 Brakes are solid and direct, though the car is currently running on a single booster instead of its original twin configuration (a period reliability fix). The original second booster is included in the sale, however, it will need to be rebuilt or replaced before reinstallation. 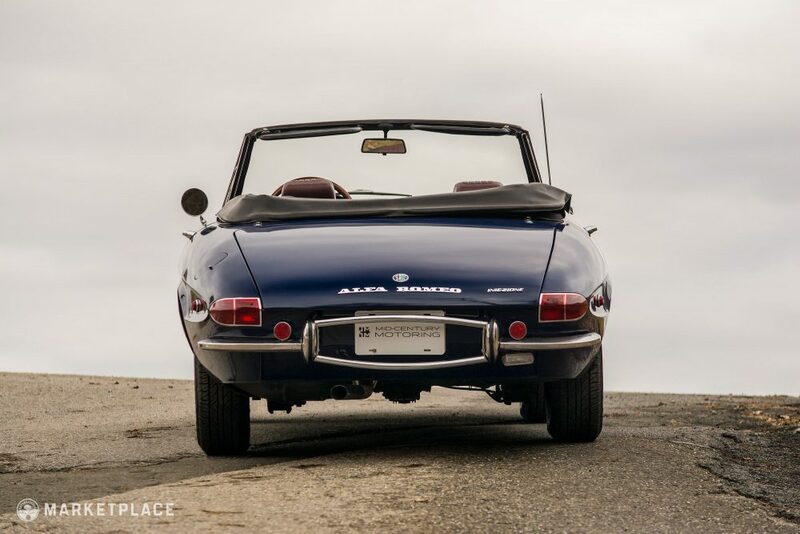 There’s a certain magic about cars that remain with their original owners for the long haul. 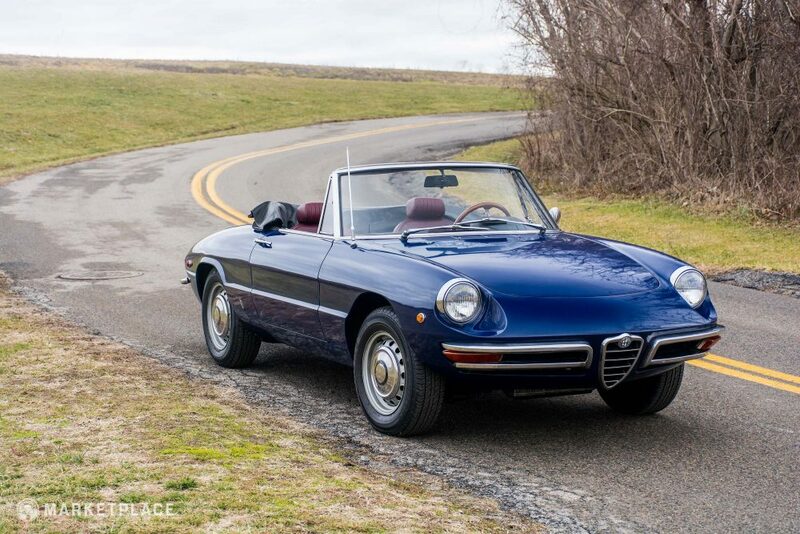 This Alfa has an indescribable effect in person—it provides an intoxicatingly powerful link to the past, an aura of sunny drives from an iconic, distant time. 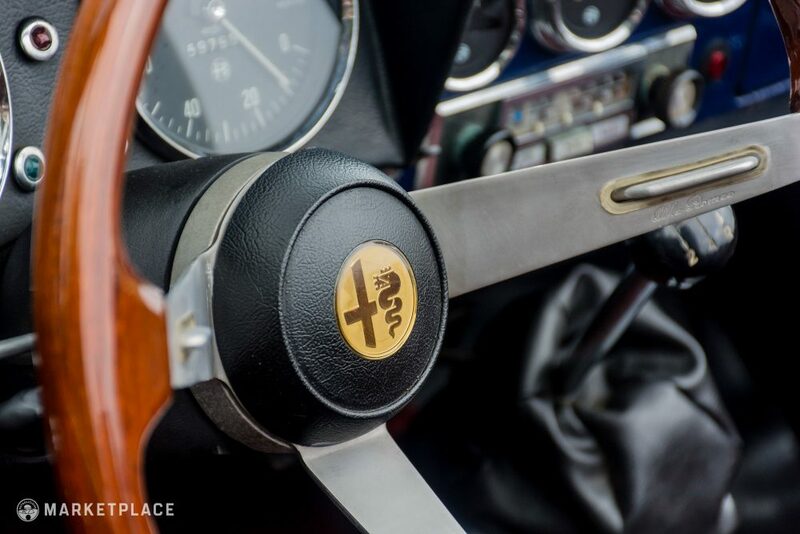 Every sensation of overwhelming nostalgia contributes to the understanding that this car has never been disturbed, or abused, or embellished, or forgotten. Restored classics are incapable of providing such thrills. 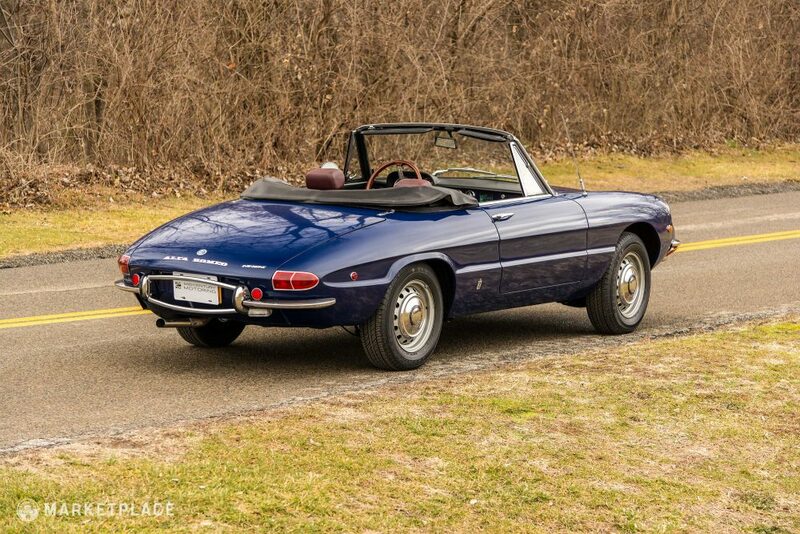 This Spider is offered with a comprehensive and carefully organized history and parts file. The original title is intact and clearly shows Ms. Matthews as the first owner post-factory. 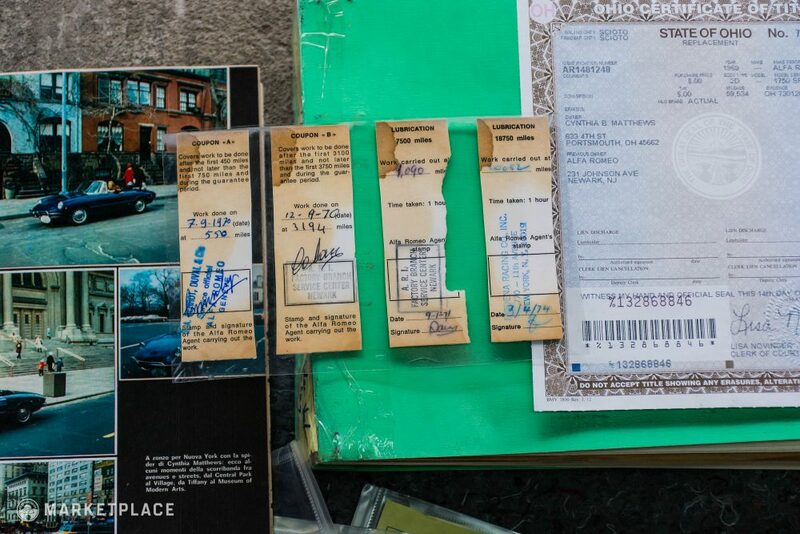 The early, original service stamps were saved from the damaged booklet and laminated, along with decades of other bills and receipts. 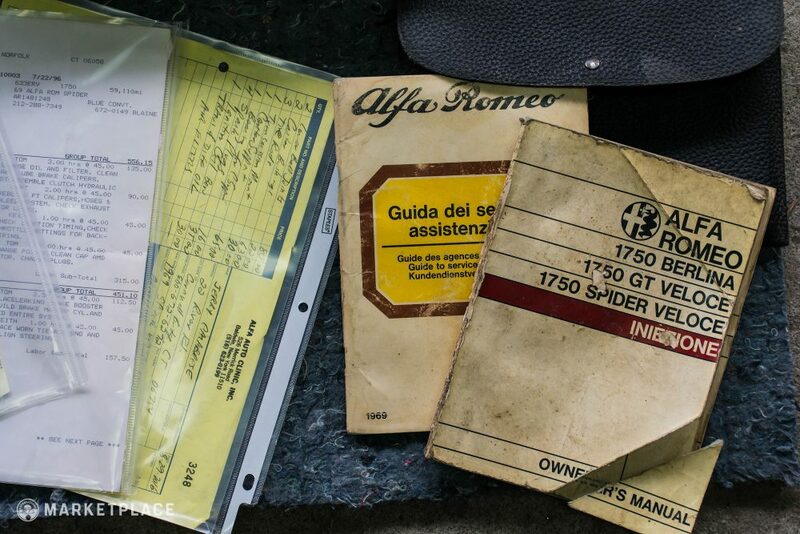 The radio manual is intact and stored in a period Agip folio—most likely from the first few months spent on the roads of Europe. 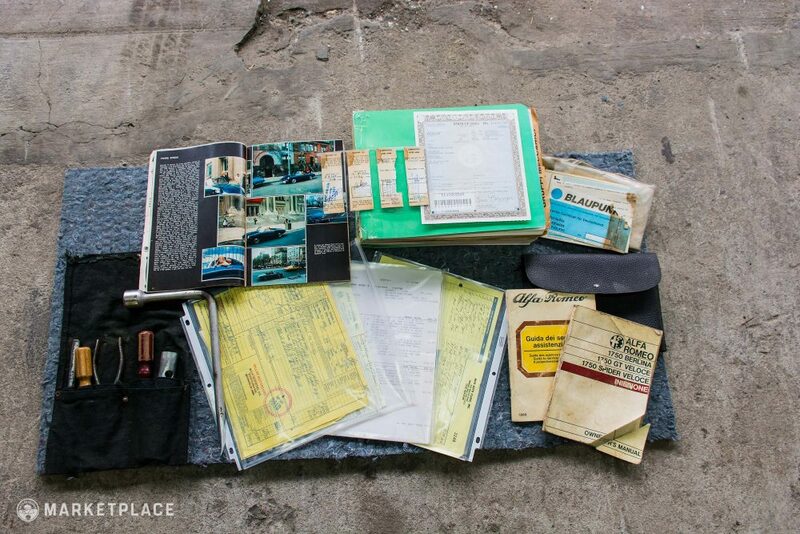 A complete tool roll, set of spare keys, and spare tire with its original stamping are also included. 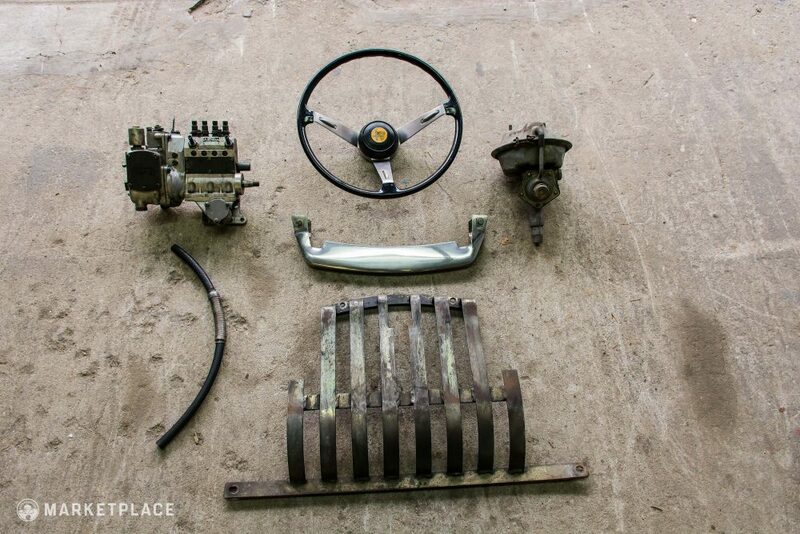 Spare parts include the original injection pump, correct steering wheel, front nerf bar, sump guard, and the second brake booster. 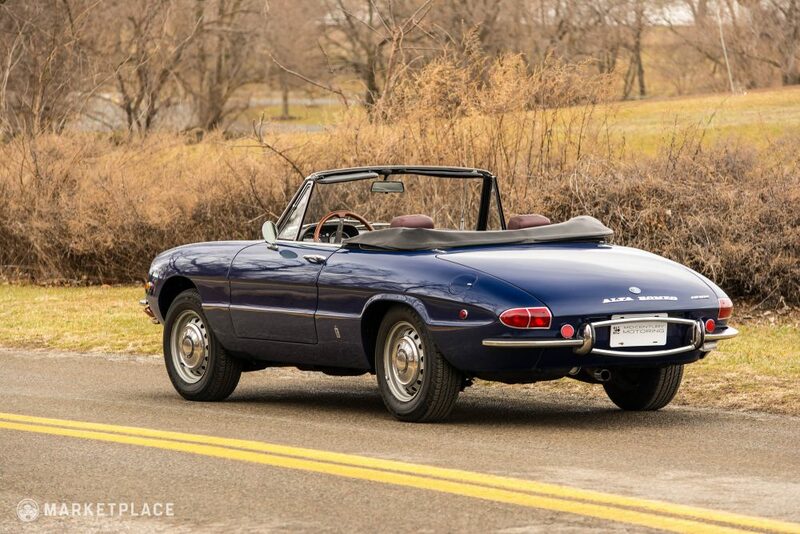 Beat the Market: All “roundtail” Spiders are rising in value, though the early cars (1966-67) have been leading the charge. 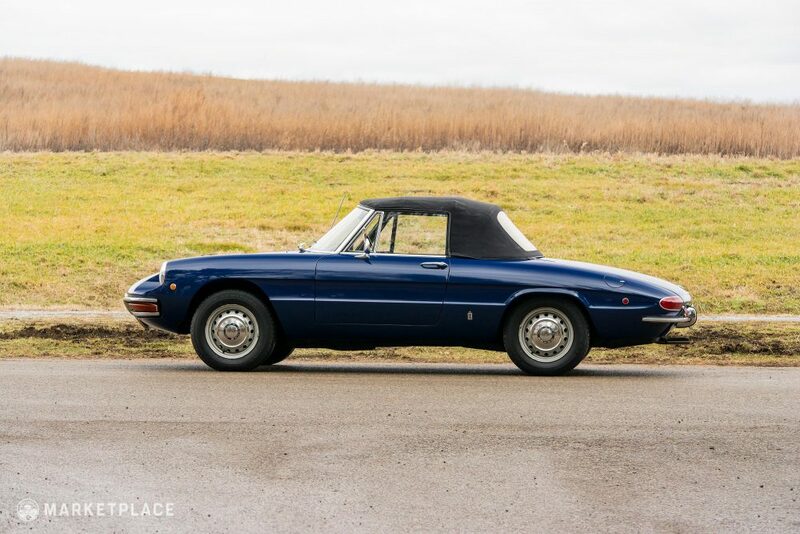 With the same look and a more powerful engine, the 1750 Spider represents an excellent opportunity to join this hot market. 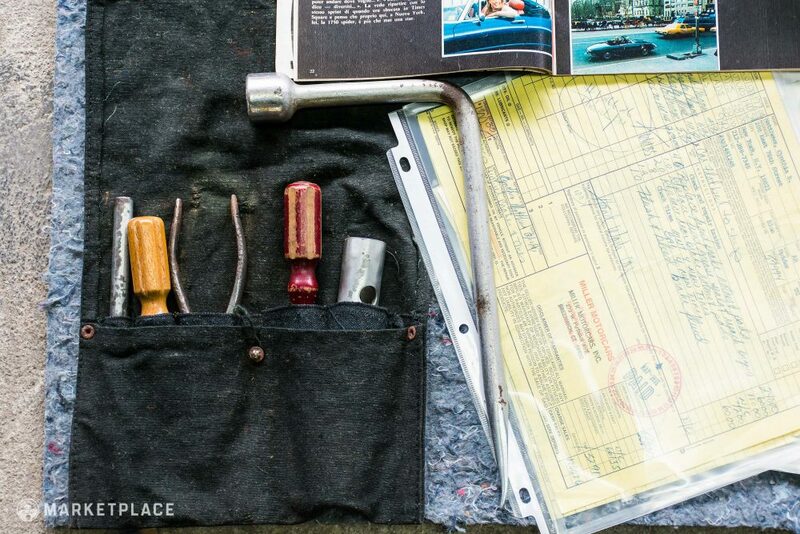 A Storied Past: The one thing you can’t restore is a car’s story. So buy one with a well-documented, exceptional past and enjoy being part of its next chapter. 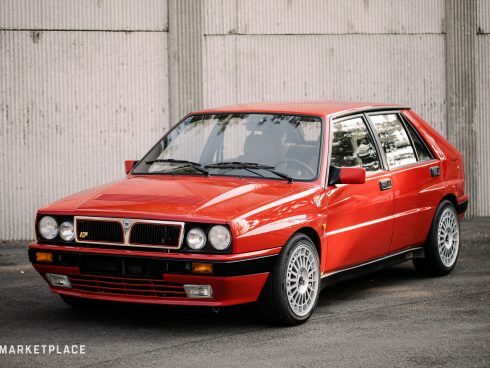 Usable Classic: Comfortable, easy to use, and with surprisingly robust drivetrains, these Alfas are a blast to own and enjoy excellent parts support as well. 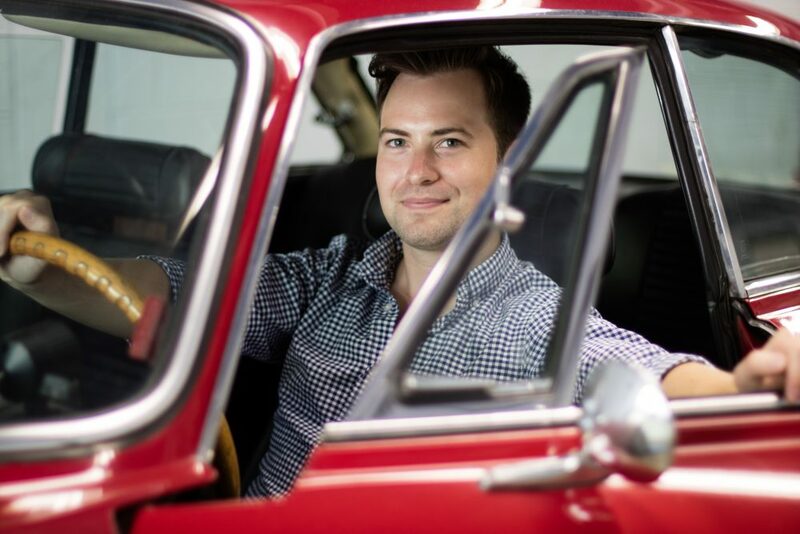 This car is for sale by Benjamin Tarlow of Mid-Century Motoring, you can get to know him better here.